The younger players at Doncaster look up to James Coppinger, who has made 574 appearances for the club. 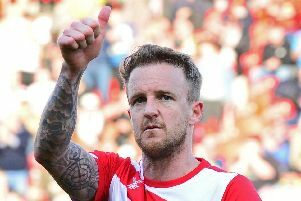 James Coppinger is optimistic about the direction that Doncaster Rovers are heading in. But the 37-year-old has warned the club’s growing band of younger players not to rest on their laurels after consolidating back in League One. The development of the likes of Joe Wright, Niall Mason, Ben Whiteman and Alfie Beestin - and the way Rovers gradually got to grips with life back in the third tier - would seem to offer plenty of encouragement for next term. But club stalwart Coppinger has sent an important message to his young teammates. “I expect more from the younger players that have played this season,” he said. “They’ve stepped up - and they’ve got to keep stepping up. “It’s not a matter of just being satisfied with what they’ve done this season. And I know they won’t be because you’ve got players there that want to do well and want to progress. “That’s what you want. You want hungry players that want to do well. “For me, Butts [Andy Butler], John [Marquis], Rowey [Tommy Rowe], as the senior players, it’s what you want to see. “You don’t want to be having to tell them every single day to do certain things. “There’s only a certain amount of times you can do that and the manager would probably say the same thing. “You need them to step up. “At the back end of the season I thought we were fantastic and I thought they were fantastic as well. Coppinger will embark on his 15th season with Rovers in August after penning a new one-year deal. “Squad-wise I think we’re where we should be,” he said, assessing the club’s current position. “Getting promoted at the first time of asking was really good. To do it with five games to go was unbelievable. It was just a shame how we finished the season. “We went to League One with the same squad more or less. For sixty to seventy per cent of the team it was their first season in League One. “It’s not easy. Look at the teams that have gone down: Bury, Oldham, MK Dons. They’ve all got experience in their teams. “Yet we did really well. There was only two or three games that we weren’t in. A lot of those games we lost or drew down to experience. They came down to the little things that you’d like to think that, over the next couple of years, these players will get to grips with.